No Friends? Blame the Traffic…. I’ve got to say- even I was startled by the degree to which car traffic is degrading ordinary people’s lives. 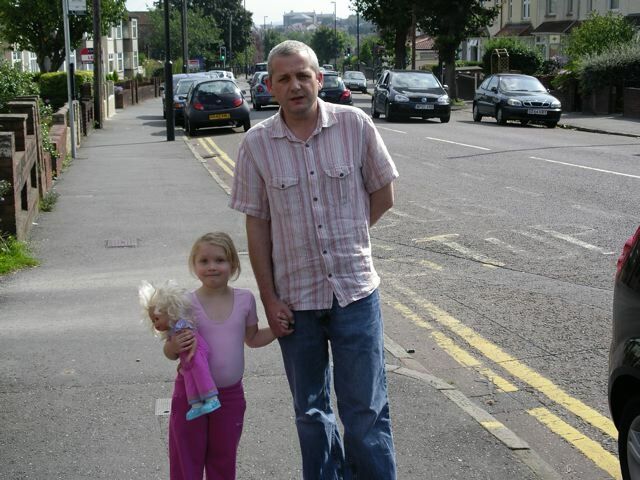 I interviewed 60 households on three north Bristol streets for my Masters dissertation- a replication of the famous Appleyard study, and it’s really true that cars are wrecking people’s health, quality of life, and social lives, not to mention the atmosphere of our entire planet. I’ve worked on this project over the past year, and I’ve been itching to write about it on my blog, but I wanted to wait until it made a splash in the media. The research, Driven to Excess: Impacts of Motor Vehicle Traffic on Quality of Life in Bristol UK, is available for download at here. 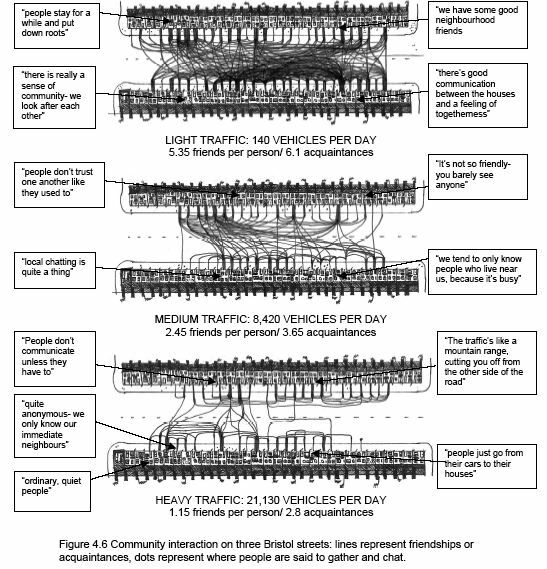 I hope all this publicity will bring more attention to the incredible work of Professor Donald Appleyard who carried out the original study on traffic’s impact on neighbourhood interaction in San Francisco. Funnily enough, he was an Englishman who went to San Francisco to do his study, and I am a San Franciscan who returned to England to re-do his study nearly 40 years later. Knock on wood I don’t meet the same fate (he was killed by a car, tragically). People living on streets with heavy motor vehicle traffic are experiencing a considerable deterioration of their local social lives according to Joshua Hart, a researcher from the University of the West of England. Results suggest that residents on busy streets have less than one quarter the number of local friends compared to those living on similar streets with little traffic. The study looked at three streets in north Bristol with light, medium and heavy traffic respectively. It found that motor traffic, which has grown more than tenfold in the UK since 19501, has a considerable negative impact on quality of life, particularly for residents living beside heavy motor traffic flows. “Traffic is like a mountain range, cutting you off” said one man on the heavy traffic street, Muller Road, where over 20,000 cars drive by his house every day. Interviews with residents indicate that growing motor traffic has forced people to make major adjustments in their lives, to shield against the nearly constant noise, pollution, dust and danger outside their front doors. Many residents revealed that they experience sleep disturbances, no longer spend time in the front of their homes, and curtail the independence of their children in response to motor traffic. “Our 4-year-old girl has a constant cough and we limit the amount of time she spends outside…we’re constantly breathing in pollution,” said one father. This research, carried out as part of a Transport Planning MSc, confirms for the first time in the UK the results of a 1969 San Francisco study by Professor Donald Appleyard2, who also found deterioration of community on busy streets. For a list of media outlets who covered this study, see the Driven to Excess Media Page. I have often felt that it was perhaps the car that was leading to he social breakdown that has been detected over the decades. This research goes some way to indicating that if we want a cohesive society like we used to have car usage has got to change. Really interesting to hear that even on “quiet street” people don’t allow children to play out because of the possibility of the occasional speeding motorist- in turn leading to less social interaction, even on this quiet street. Wow! This is great work!! Thanks so much for doing this research and posting about it. I live in a neighborhood in the US that has a lot of foot traffic and is very walkable, and as soon as we moved here we felt like we got a whole community of new friends. Also, because we are car free, we really invest our time locally (as opposed to driving to see far-off friends) and I think that makes a big difference as well. Great work, and fantastic coverage in the media. We are using your study to lobby our Councillors, and I urge everyone else to do the same. Then get those same Councillors to read your Venue magazine interview http://tinyurl.com/4janju so they know what to do to sort out the problem.